NOTE: This article also led to a feature in Discover Magazine. “Male zebras can father more than a hundred offspring in a lifetime, whereas female zebras are constrained to minimal reproductive rates—about one a year,” Cameron said. 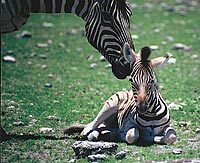 “Sons, therefore, offer higher breeding rates to zebra parents, while female offspring are a lower-risk investment. The problem with this idea is that, until now, only about 30-percent of studies have supported the hypothesis, which has been debated because there have been so many studies that have attempted to test the idea. The results have been contradictory—some find support for the hypothesis, some do not, Cameron said. But in a journal article published today in the “Proceedings of The Royal Society of London: B,” a journal of the independent scientific academy in the United Kingdom, Cameron asserts that there’s a good reason to support the hypothesis. It could all boil down to the amount of glucose, or blood sugar, in a female mammal’s body around the time of conception, Cameron said. This finding is key to the Trivers-Willard debate, and if supported in future studies, Cameron’s theory could have dramatic influence on wildlife control and animal production. “If you can get dairy cows to have more female calves, it would have huge implications for the dairy industry,” she said. Such a study would be able to show whether mammal populations in different regions could be increased or decreased, based on the needs of those areas, she said. In eastern Nevada, for example, declining populations of mule deer could be better researched by taking into account Cameron’s contribution to the decades-old scientific controversy.